We are all familiar with the hard line economic and social realities we face in our 21st Century American society today. Housing costs have spiraled beyond the reach of an overwhelming number of working families and other households with limited incomes. Many communities are facing a rapidly dwindling supply of build-able land, forcing the price of remaining, available lots ever higher. And, given the cutbacks in federal support for affordable housing and the limited supply of charitable dollars available from the private sector, subsidy funds are always in drastically short supply. Our neighborhoods and communities are caught in the squeeze. Into this complex and troubling scenario a new set of questions is arising. Ought we be focusing our efforts to create a stock of permanently affordable housing? Does it make sense to use limited public and private subsidies to create a home that is initially affordable but becomes unaffordable the first time the ownership is transferred? Does it not make more sense to preserve these precious subsidies by locking the subsidy into the unit to keep the unit affordable forever? Against this background, the community land trust has emerged. Community land trusts offer a practical means of preserving permanent housing affordability at the same time that they provide property and ownership. Community land trusts (CLTs) typically acquire and hold land and sell off any residential or commercial buildings that are on the land. Title to the land is held in perpetuity by the CLT and governed by the members. In this way, the cost of land in the purchase price of the home is minimized or eliminated, making the housing more affordable – while assuring long-term stability and security for the CLT homeowner. The CLT owns the land and families own the house. At the same time, CLT homeowners are able to experience the true benefits and obligations of homeownership. 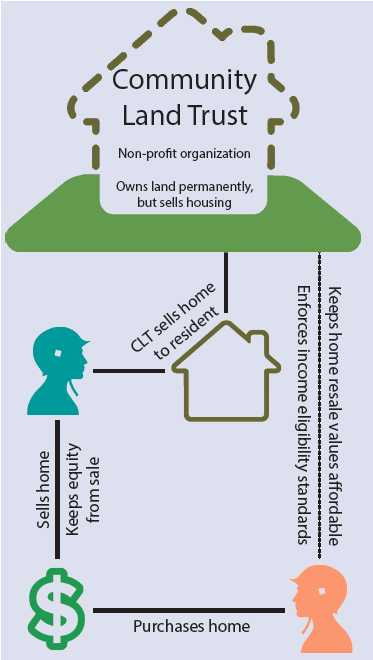 CLT homeownership qualifies for homestead classification in the assessment of real estate taxes – and the CLT homeowner is responsible for payment of all property taxes on their home and the land on which it sits. CLT homeowners are able to deduct the mortgage interest paid when they file their tax returns. And all CLT homeowners enjoy the same tangible benefits that homeownership provides to anyone fortunate enough to own their own home security, stability, the opportunity to live in a community of their choice, proximate to work and school and family and friends. And all of this is situated within a community-based, nonprofit organization governed by a board of directors that is broadly diverse and representative of the interests of the community that is served. CLTs have effectively negotiated mortgage financing commitments for CLT homebuyers from a variety of established lending institutions. Many banks provide “affordable mortgage” products through their community lending departments, offering mortgages the bank will hold in its lending portfolio. Fannie Mae has also embraced the community land trust model – and banks can originate loans that can be sold on the secondary market to Fannie Mae. Additionally, USDA Rural Development has been willing to participate in mortgage financing for CLT homebuyers. And many state housing agencies have made arrangements to provide gap funding and mortgage financing products to qualified community land trusts within their jurisdiction. CLTs develop affordable for-sale and rental housing, commercial space, and parks while promoting homeownership, housing stability, historic preservation, neighborhood revitalization and – importantly – local control.